This entry was posted in Soap Design Techniques and tagged bamboo charcoal, Bamboo charcoal & clay soap, Clay Drop Swirl, DOS, Dreaded orange spots, Drop swirl, Ecoviolet soap, handmade soap, Mica oil swirl, olive oil soap, soap, Soap challenge, soapmaking by ecovioletsoap. Bookmark the permalink. Thanks Maya! And thank you for the bamboo charcoal! I usually premix my colorants but I did as you suggested and added it directly into the soap batter. It blended beautifully. I made another drop swirl with it but it didn’t make the challenge deadline. 😦 And yes, looking for orange spots is fun now. I think I may have seen my first couple of spots – the DOS developed after a week with one lot of olive oil and is currently a faint dark yellow spot. I think that it will get darker over time and become orange. Nice swirling! And I’m looking forward to learning more from your DOS experiments. Thanks for sharing! Thanks Ruth! And thanks for your mica swirl tips! Your suggestions made it so easy to do this swirl. I am also excited about the DOS project. I am starting to see DOS with one particular olive oil lot so it will be interesting to see if they develop with the other lots. This will probably be a year long project but I need some DOS data for the class in reliability statistics so I am hoping some DOS will appear within a couple months. I have some lots that I expect will be worse case (tap water, older olive oil lots, no additives) so we will see if my hypothesis is correct. Nice swirling! And I’m looking forward to learning from your DOS experiments. Thanks for sharing! Isn’t charcoal awesome to use? It provides good contrast and it’s a skin detoxifier too. Your mica swirls came out beautiful! Thanks Silvia! Love using the charcoal- it’s really nice and easy to use. Scientific Soapmaking is great! Kevin Dunn has written a great reference on soapmaking. 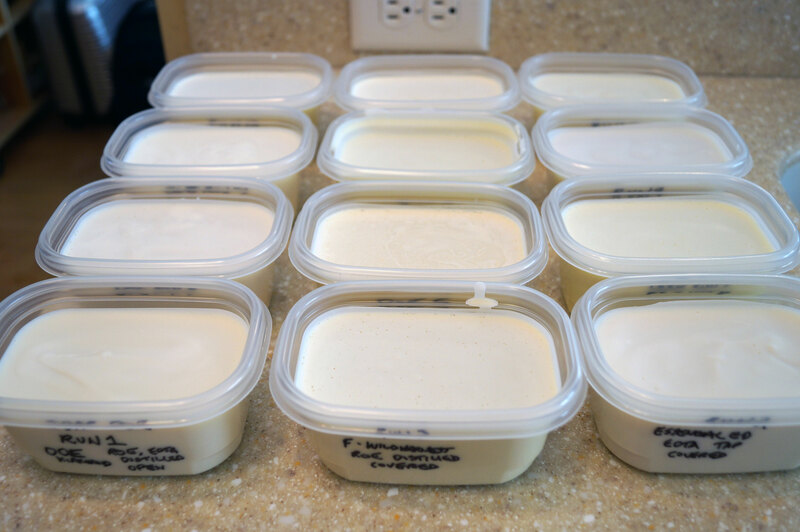 His DOS experiment was based on accelerated aging of soaps at 60C (140F) but it would be interesting to see how the results compare to standard room temp. curing of soap. And unlike his study where he changed only one thing at a time, it is possible to change multiple things at the same time and get useful results if you set up the variables mathematically in a statistically designed experiment. I tried to pack in the factors so I can get the most bang for my buck. I just need to see some orange spots now! Beautiful drop swirl and mica oil swirl…such fun techniques! Did you find that the charcoal and clay thickened up your soap at all? Usually it does for me, but your droplets look like they stayed nice and fluid! That is so cool that you get to study DOS…please keep us posted!!! Thanks! It is a technique I will definitely do again! I love your mica swirls! 🙂 They are so delicate and pretty. Thanks! Haven’t seen really bad DOS yet but will keep everyone posted. 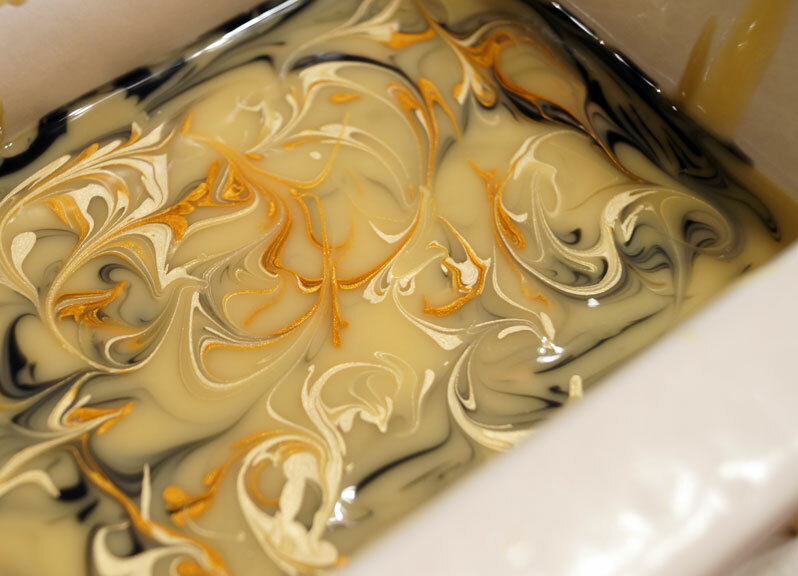 Beautiful swirled soap! I’d like to know how the study on DOS works out, too. Thanks Janie! Me too- it’s better then being surprised a few months down the road! So pretty!! Activated charcoal is an awesome way to get a natural black color. Your DOS study should be fascinating as well! My name is Maja (Maya sounds perfect, 🙂 ) and I have a question. What are various factors included in your study? I realized all batches were Castille, but didn’t catch the factors which were supposed to vary. Sorry if you had told this before. I’m so eager to know what results you will get. 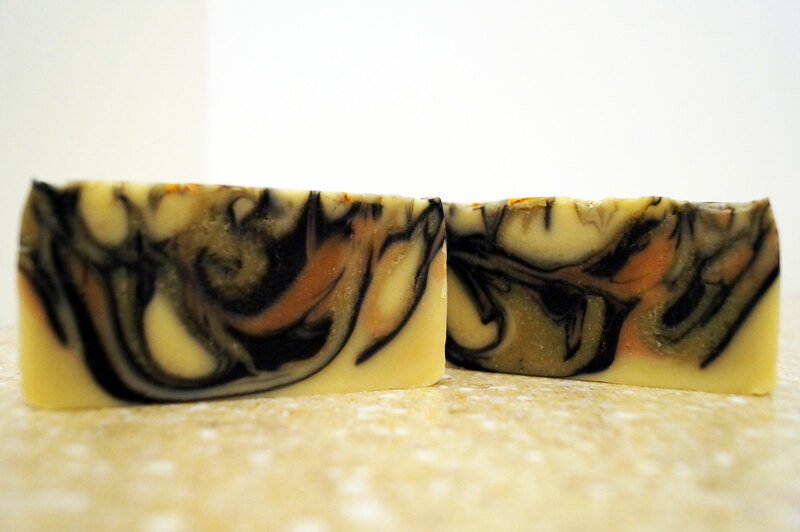 Your soap looks mysterious and the top is very beautiful! Thanks! This sounds soooo intriguing, I can’t wait to see the results. This bars are so beautiful to me! I particularly like the shape of the bar and the smokiness obtained from the blend of clay and activated charcoal. I’ve been coming across all these posts about soaps colored naturally while I’m trolling blogs; I really want to try coloring things with some clay, too!